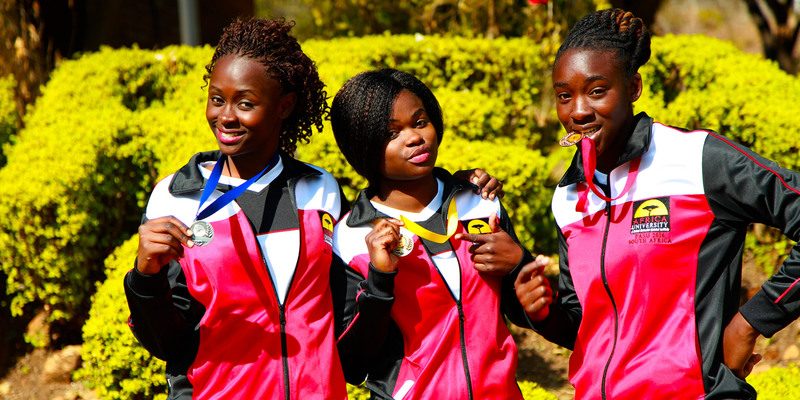 Three female Africa University students Nozipho Makhanda, Progress Gadzikwa and Nunururai Manyevere are currently in South Africa, representing Africa University, at the 2016 8th Federation of Africa University Sports Association games. This year's event, which kicked off on June 26, takes place at the University of Johannesburg and Tshwane University of Technology. The competitions come to an end on 02 July 2016. The tournament, commonly known as the FASU Games, is a multi-sport university event organised every after 2 years. Athletes from degree awarding institutions are competing in 9 sports disciplines including; Athletics, Badminton, Basketball, Chess, Football, Volleyball, Netball, Table Tennis and Tennis. Africa University Acting Sports Director, Mr. Ted Ruzvidzo explained that the ladies are taking part in athletics and he expressed confidence in their performance at the competitions. I am confident that the ladies will be good ambassadors for Africa University and that they will do us proud. said Ruzvidzo. Africa University remains committed to supporting students in sports. The University realises that sports are an important component to students' quality of life on campus. The representation of Africa University at the FASU games by female students is also a clear indication of the University's continued support of the girl child in Africa.